An asphalt path that wanders along the north shore of Big Bear Lake. Easily accessible for hikers, bikers, skaters, joggers, strollers and wheelchairs. It starts at Stanfield Cutoff and ends at the Solar Observatory. A unique nature trail with 20 posted stops. Pick up a pamphlet at the entrance and take the self-guided tour where you will learn about botany, geology and the wildlife of this woodland area. You can leave your car in the parking lot if you exhibit an Adventure Pass. The Lodgepole Pine Trail is on the south side of the lake and is a gentle walk down a path along a stream, ending up at the Champion Lodgepole Pine, one of the largest known lodgepoles in the world. Begin by drivnig up Mill Creek Road (Forest Road 2N10-dirt road) for 4.5 miles, turn right on 2N11 adn contineu 1 mile to the trailhead. Castle Rock Trail is one of Big Bear's most popular trails. The trail begins 1 mile east of Big Bear Dam on Hwy 18. On the south side of Hwy 18 is a small brown sign that marks the trailhead. Park at the turnout along Hwy 18. The elevation gain is 500', making it a steep climb for the first .5 miles. The well-marked trail levels out for another .7 miles. At the top is an impressive granite rock outcropping providing 360° panoramic views. Hikers begin at the base of Aspen Glen Picnic Area, just south of Mill Creek Road. The trail meanders through stands of white fir and Jeffrey pine. The trail leads to Grand View Point, altitude a7,784'. Avid hikers make the round trip hike in three hours or less. Mountain bikers take the Scenic Sky Chair to 2N10 west to 1E01 for a thrilling single track experience. Starts .6 miles west of the Discovery Center on Hwy 38. You will need an Adventure Pass to park in the trailhead parking area. On the trail you will walk through a wide variety of natural environments. The first mile is a gentle uphill climb, but after a mile or so you will realize you are gaining altitude. The Cougar Crest Trail ends at the juncture of the world-famous 2,600-mile long Pacific Crest Trail. A very popular novice ride that starts by taking the Snow Summit Scenic Sky Chair. This ride has a 3-mile roller coaster ride to Grandview Point Junction. There you have the option to ride 2.5 miles to Grandview Point where the view is beautiful and well worth the extra time. This trail starts with a short paved climb from the Fawnskin Fire Station up to 3N14. Continue 2.5 miles to Hanna Flat campground. From there, Grout Bay Trail starts at the back of teh campsite and starts climbing. The trail climbs and descends, ending your ride back in to Fawnskin. To complete this loop you'll need stamina and basic navigation skills. Start at Van Dusen Canyon Rd. 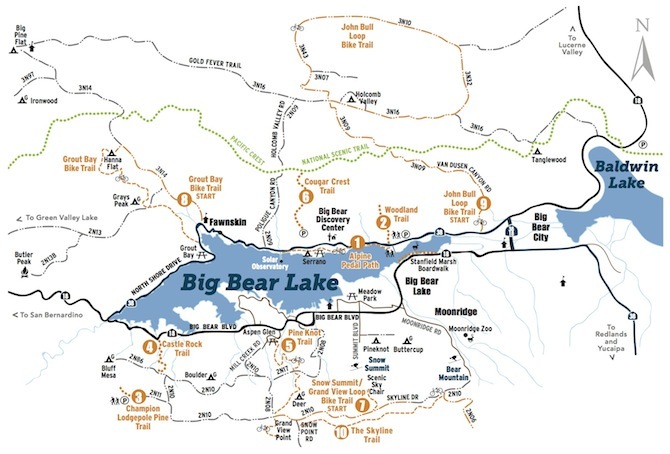 (3N09) and ride up 3.5 miles to Holcomb Valley to 3N16 turn left, to 3N07 turn right, to 3N43 turn left to "The John Bull Trail" (3N10). It's about 3 miles of technical riding before you come 3N32; Turn right to 3N16; Take another right at 3N09, which will lead you back to your starting point. The Skyline Trail 16 miles up and back; beginner to intermediate The new multi-use trail, designed for mountain biking, hiking and horseback riding, is located on the backside of Snow Summit, and begins where the US Forest service roads 2N10 and 2N06 meet. The trail parallels the 2N10, and snakes from east to west. The Skyline Trail is designed to become the backbone of a new South Shore trails system with connections to existing trails and future trails. When the trail is completed it will meander through the forest for a 15 mile loop that starts and ends at the backside of Snow Summit.